For those people who don't live in LA, you may not care. The 405 freeway will be shut down for a couple of days while they take apart a bridge for a roadway widening project. This means that half a million cars will have to be diverted each day and it will be fun, fun, fun! Everyone knows that the public transportation system in LA is a joke so that's not an option. And walking anywhere in this city is illegal so that's out. Riding a horse just isn't practical for a couple of days. Neither is renting a plane. So, my fellow Angelenos, we're going to have to tough it out in our cars. I hope the good Lord blesses us with some great radio stations and a helluva lot of patience because we're gonna need it. And we'll also need some alternate routes besides the 405. Let's just say you wanted to go from North Hollywood to Santa Monica for work. This is the road that you probably would take, highlighted in purple. 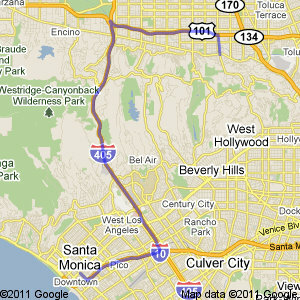 But while CARMAGEDDON is going on, I suggest the route highlighted in red. Just tell your boss you'll be a little late.